I love eggs. From my head down to my legs. D*mnit, cheesy marketing jingles got me again. But fo’ real, eggs are one of the most perfect foods. Why is that? Well for starters the yolk contains a plethora of nutrients, including Vitamin B12 and Selenium. They also score high on the Satiety Index, which means they fill us up and also have been shown to contribute to weight loss (1). They also have lots of PROTEIN. And all 9 essential amino acids, making them a complete protein. But what about cholesterol? What if I were to tell you that eggs have actually been shown to improve your cholesterol profile? (2) There are two types of cholesterol– the kind you eat and the kind your body makes. If you’re not consuming enough, your liver will begin to produce more of it. A cardiologist at the Cleveland Clinic, Dr. Steven Nissen, estimates that only 20 percent of your blood cholesterol levels come from your diet. It’s not so much the cholesterol you are consuming, but the quality of the food and it’s ability to move through the body. It’s when we are inflamed that the cholesterol tends to stick and cumulate, and then we’ve got problems. As the Notorious B.I.G. would say, mo’ inflammation mo’ problems. Well he wouldn’t really say that, but I would. So let’s make some egg muffins! This is a great way to start your day with an energizing and filling breakfast, with lots of healthy fats and proteins. The more satiated you feel after your meal the less likely you are to snack on not-so-good things. 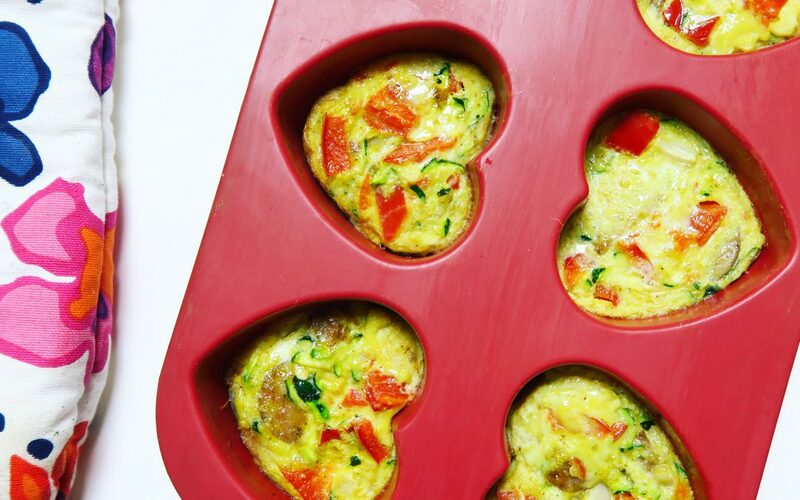 Make these on the weekend, toss them in a tupperware, and BOOM you have a fast and easy breakfast for each day that week. Pop in the oven for 20-25 minutes or until egg muffins solidify (they’ll begin to pull away from the sides. Avoid browning since burnt eggs are hella gross.